A week or two ago I implemented some basic functionality for work with integral curves of vector fields. However, I needed to make additional changes in other parts of SymPy in order for the ODE solver to work with systems of equations and with initial conditions. I also wanted to get my plotting module merged so I can show some visualizations if necessary. The r index is for rectangular coordinate systems and the p index is for polar. Here we have equations for the functions and which are by convention the names that intcurve_diffequ gives for the first and second coordinate. # towards an equilibrium radius. # We need this in Cartesian coordinates for the plot routine. However these series do not always converge to the solution, so care should be taken. There are other amusing possibilities already implemented, however I will write about them another time. If you want to suggest more interesting examples, please do so in the comments. The Differential Geometry module for SymPy already supports some interesting basic operations. However, it would be appropriate to describe its structure before giving any examples. # Patch and coordinate systems. # Connecting the coordinate charts. All following examples will be about the manifold which is already implemented in the code for the module. Also, notice the use of the inverse and fill_in_gaps flags. When they are set to True the CoordSystem classes try to automatically deduce the inverse transformations using SymPy’s solve function. Now that we have a manifold we would like to create some fields on it and define some points that belong to the manifold. The points are implemented in the Point class. You need to specify some coordinates when you define the point, however after that the object is completely coordinate-system-idependent. Then one can define fields. ScalarField takes points to real numbers and VectorField is an operator on ScalarField taking a scalar field to another scalar field by applying a directional derivative. For example, here x and y are the scalar fields taking a point and returning it’s coordinate and d_dx and d_dy are the vector fields and . R2_r is the Cartesian coordinate system and R2_p is the polar one. And this new object potential2 is not an instance of ScalarField. It is actually a normal SymPy expression tree that contains a ScalarField somewhere in its leafs (namely in this case it is Pow(R2_p.r, -1)). However, due to the change to one of the base classes of SymPy that I did in this pull request it is now possible for such tree to be a python callable, by recursively applying the argument to each callable leaf in the tree. This change is still debated and it may be reverted. This way there is no need for complicated logic in __mul__ nor is there need for addition subclasses of Expr in order to accommodate this behavior. There is not much more to be said about the structure of the module. 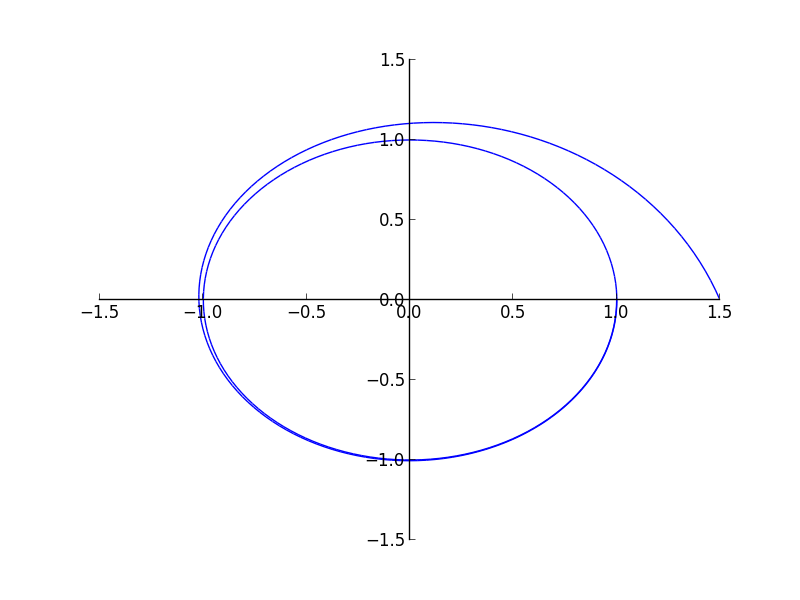 There are some other nice things already implemented like integral curves, however I will discuss these in a later post. Should vector fields be callable on points? If yes, what the result should be? An abstract vector, a tuple of coordinates in a certain coordinate system, something else? There are many expressions generated by this code that are not simple enough. I should work on the simplification routines and on the differential geometry module itself in order to get more canonical expressions. The last point is also valid about the solvers: some coordinate transformations are too complicated for the solvers to find the inverse transformation. Manifold and Patch have name attributes. Are these necessary? What is the role of name attributes in SymPy besides printing? Start using Lambda where applicable. Follow better the class structure of SymPy.